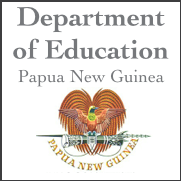 The Curriculum Development Division (CDD) is located within Papua New Guinea Education Institute in Waigani, Port Moresby. The Assistant Secretary oversees the function and operations of the Division. The main function of the division is to develop and distribute curriculum materials to schools, organisations, churches and decision makers around the country. CDD has three branches. These are Elementary Branch, Primary Branch and the Secondary Branch. This branch has a director who oversee the function and operation of the branch. Elementary Curriculum officers are under the Director. The branch produces all the curriculum materials for elementary schools, that is Grade 1 to 2 in Papua New Guinea. A Director Primary overseas the operation and function of the branch. Senior Curriculum Officers and Curriculum officers make up the branch. The branch is responsible for producing and distributing curriculum materials for Primary Schools (Grade 3 - 8) in Papua New Guinea. Director Secondary overseas the function and operation of the branch. Secondary Curriculum Officers produce and distribute curriculum materials for secondary schools in the country. The Division can bet contacted on the following address. The Measurement Services Division (MSD) formerly known as Measurement Services Unit (MSU) is one of the Divisions in the Education Department. It is located at the Standard Building within the PNG Education Training Institute at Waigani in Port Moresby. The division is responsible for examinations and assessment in the country. The role responsibility of the Examination Branch is to develop , print, and distribute examination materials for Grades 8, 10, 12 throughout the country. It is also responsible for certifying students after the exams. The branch is looked after by the Director. There are three sections. This branch takes care of School Assessments, Curriculum Standards and Monitoring Test, research and data analysis. The branch has the director. All the division within the Education department are listed here. Please feel free to contact us if you require further information.